Company Steinberg presented new modification of one of its entry-level USB audio interfaces UR22mkII, supporting 192 kHz and 24 bits work mode, 101 dB dynamic range, and having 2 inputs, 2 outputs and 2 inputs preamplifiers Yamaha D-PRE Class-A. On its frontal panel there are : 2 combined XLR/TRS 1/4″ jack microphone/linear inputs with volume control knobs, clip indicators, common phantom power +48 V LED light and USB connection activity signaler; 2nd input can work in instrumental Hi-Z mode and there is according switch button. Also on it there are : mix controller analogue inputs/signal from digital USB connection; TRS 1/4″ jack monitor headphones output with volume control; and main interface outputs’ volume control knob. On back panel of Steinberg UR22mkII there are can be found : power adapter input and USB port for connection to computer and powering, as well as power from one of these connectors selector; MIDI input and output; phantom power for inputs of interface switch; and left and right linear TRS 1/4″ jack outputs. 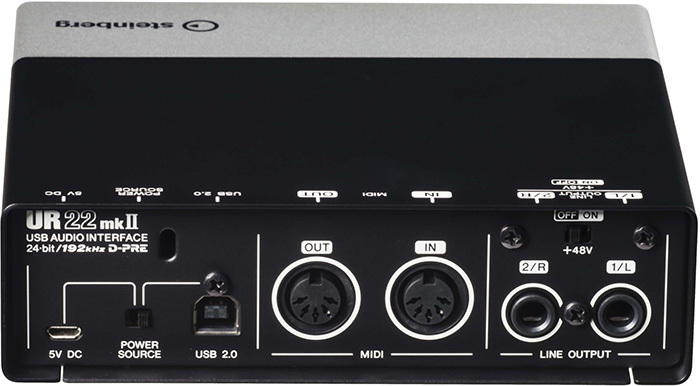 Device supports functions True Integrated Monitoring in DAW Steinberg Cubase, Loopback for mixing of digital and analogue signals and their returning to computer for subsequent streaming; and is a Class Compliant – compatible with Apple iPad via Apple Camera Connection Kit adapter. Audio interface works in Windows 7, 8, 8.1 and 10 and Mac OS X 10.7 and newer via specialized drivers with support of ASIO 2.0, WDM and Core Audio interfaces, via which interacts with modern DAWs : FL Studio, Cackewalk Sonar, REAPER, Avid Pro Tools, Ableton Live, Steinberg Cubase and others. Besides main sampling rate, Steinberg UR22mkII also supports 44.1, 48, 88.2, 96 and 176.4 kHz; all analogue inputs and outputs of device can work in balanced and unbalanced modes, except of instrumental Hi-Z inputs, which work only in unbalanced mode. Working frequencies range of microphone inputs equals to 20 Hz – 22 kHz ( with deviation +0.1 dB / -0.3 dB ), dynamic range is 101 dB ( A-Weighted ), THD+N – 0.0035%, maximal input signal level is – +4 dB, input impedance is 4 kOhms and gain levels are in +6 – +60 dB range. Linear inputs have following characteristics : maximal input signal level is +24 dB, impedance is 20 kOhms, gain levels range is -14 – +40 dB. Instrumental Hi-Z inputs : maximal input signal level is 8.5 dB, impednace is 1 MOhm, gain levels are in -0.7 – +53.3 dB range. Linear outputs specifications are : working frequencies range equals to 20 Hz – 22 kHz ( with deviation +0.1 dB / -0.3 dB ), dynamic range is 104 dB ( A-Weighted ), THD+N 0.005%, maximal output signal level is +10 dB and impedance is 150 Ohms. Maximal power, which Steinberg UR22mkII can give to headphones equals to 6 + 6 mW with 40 Ohms impedance; device draws maximum 2.5 W of energy. For installation of DAW Cubase AI there is need in connection to Internet for downloading of additional data with 500 MB size. 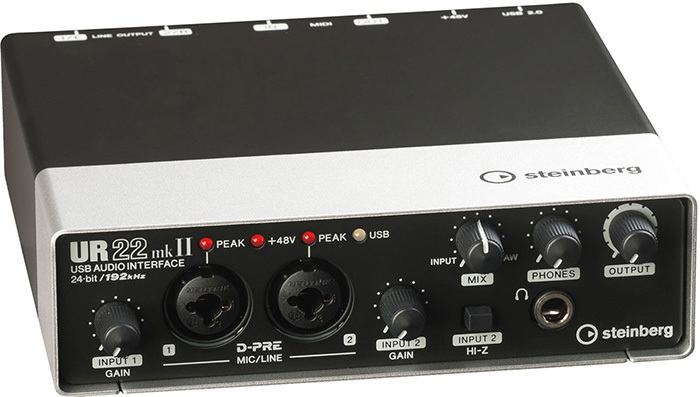 Steinberg UR242 supports following DSP effects : Latency-free monitoring with FX ( dspMixFx ), True Integrated Monitoring with FX in Cubase, Guitar Amp Classics, REV-X Reverb, Sweet Spot Morphing Channel Strip, Phase switch per channel and High-Pass filter. Cubase AI – is a simplified version of professional DAW of Steinberg, it is based on the same audio engine with 32-bits float precision of calculations; can work simultaneously with 32 sound tracks, 48 MIDI tracks and 16 instrumental tracks with ability to record completed compositions to disk in WAV and AIFF formats, and in MP3 after purchsing of according module. For audio and MIDI editing in program following editors are built-in : Key, Score and Drum, pitch-shift instrument AudioWarp with support of ACID files format, which allows to use large amount of already created sounds samples, and Chord Track editor. 28 VST effects and processors are built into it for work with sounds, sampling synthesizer instrument HALion Sonic SE with 180 sound; mixing console with 4 Inserts and 4 Sends for each track and equalizer. DAW Cubase AI can work in 32 and 64 bits operating systems Windows and Mac OS X.
Sizes of Steinberg UR22mkII are 159 ( width ) x 46 ( height ) x 159 ( depth ) mm and mass is 1.03 kg; its body is completely made from aluminum with black and silver coloring for increased durability and reduction of electro-magnetic interference. With interface DAW Steinberg Cubase AI is supplied, owners of Apple iPad can download from Apple App Store DAW Cubasis LE; package with Steinberg UR22mkII contains : USB cable, optical disks with drivers and programs, warranty card and user’s guide. All in all interface UR22mkII is great and fits very well to small or in-home studios; there is ability to anticipate, that Steinberg will not set high price for device and it can be recommended for purchase. There is also ability to look on other USB audio interfaces of Steinberg, Behringer, Focusrite, Roland, ESI, M-Audio, Alesis and other companies production, but this one – is one of the best among them. Steinberg – is a German company – creator of DAWs, VST effects, processors and instruments and also of audio interfaces, being based in Hamburg. It was established in 1984 year and now is being owned by Yamaha Corporation from 2004 year. At current moment Steinberg is one of the leading audio equipment and programs manufacturers in the world, for example, its professional DAW, instruments and hardware are used by following musicians : Hans Zimmer, Junkie XL, Justice, Kraftwerk, New Order and others.